Wanna buy a pair of lady’s slippers, anyone? Aren’t they gorgeous! No wonder, it’s pretty obvious why this tropical climber has been lovingly nicknamed Lady’s Slipper Vine and Dolls’ Shoes! Even the other common name, Brick & Butter Vine suits it fine, seeing the similarity in the colours of the attractive flowers! But why name it Clock Vine too, I wonder? Is it because the flower clusters that hang on long strings do somewhat resemble the pendulum of a grandfather’s clock as well? A rare and exotic beauty, Thunbergia mysorensis is an enthusiastic climber that can easily cover a large trellis or pergola. It produces numerous clusters of showy bi-coloured reddish brown and yellow blossoms, almost year round in favourable growing conditions. When trained over a high pergola and bloomimg, it’s truly a magnificent spectacle with countless pendulous flower clusters hanging on long chain-like spikes like a drapery, providing sheer delight, seemingly everyday of the year as the flowers are so long-lasting! We first sighted them many years ago at the Cactus Valley in Cameron Highlands, 1,500m above sea-level and still seen thriving well when we visited the garden again last year. Wonder whether it will thrive in Kuala Lumpur as we’ve yet to see them in the lowlands? Etymology: The genus Thunbergia is named after Carl Peter Thunberg, a famed 18th-century Swedish botanist and explorer, while the species name, mysorensis is derived from the city of Mysore in southern India where it originated. Features: Thunbergia mysorensis is a species of the genus, Thunbergia that comprises of about 200 species of annual or perennial vines that are indigenous to tropical Africa, Asia and Madagascar. 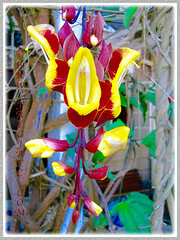 It is considered to be the prettiest flowering vine in the world as acclaimed in the book, Vines of the World. 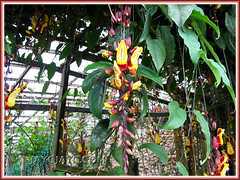 This spectacular vine grows very vigorously, often reaches 6-10 meters long in humid and warm tropical regions, but probably slow to moderate growth in cooler climes. A rambunctious evergreen climber that needs sturdy structural support for its woody and slender stems/branches that are covered with dark green opposite leaves. The leaf blades are glossy and ribbed, simple, slightly wavy and margin somewhat serrated, ovate-lanceolate in shape and approximately 12-15cm long. 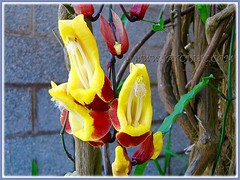 Thunbergia mysorensis will reward handsomely with fascinating and captivating flowers of fabulous colours and unusual shape almost throughout the year when matured and in well-cultured conditions. 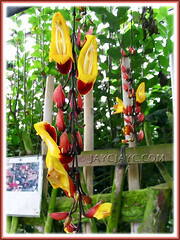 Numerous elongated and pendulous racemes are formed on long dangling string-like flower spikes, up to 1m or more in length. The dramatic 7.6cm flowers come in a wonderful bicolour combination of bright and vibrant yellow inside and reddish brown or burgundy sepals, outside. And the shape is amazingly unique, widely-mouthed and taking the form of a lady’s magical slipper or doll’s shoe. Hence the nicknames, Lady’s Slipper Vine or Dolls’ Shoes, for obvious reasons. Flowers produce lots of sweet nectar that attract hummingbirds and other pollinating insects. Being a profuse bloomer with long-lasting flowers, it is one of the highly sought-after species of flowering vines worldwide. 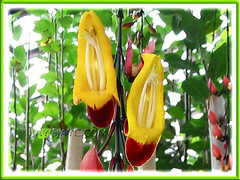 Culture (Care): Thunbergia mysorensis is an easy-to-grow tropical vine with a hardy and vigorous growth rate, though getting it to flower can be quite a skill in unsuited regions. Light: Prefers full sun to light shade. Blooms best with good sunlight and warmth in the day and cool temperatures during the night. Moisture: Water moderately and regularly, keeping it evenly moist. More water during hot seasons and less in cooler clime. Others: Encourage bushiness by tip pinching during formative years. Require regular pruning to keep it within control as it can be quite unruly with its haphazard branching, as well as to promote more blooms. It can tolerate hard pruning if necessary. Feed fortnightly or monthly with a flowering fertilizer to boost flowering. Relatively free from serious pests and diseases. For subtropical regions: Hardiness: USDA Zone 10-11. Being frost-sensitive, it thrives only in frost-free subtropical regions where it blooms from late winter through fall, though flowers more heavily during periods of warmer days and cooler nights. 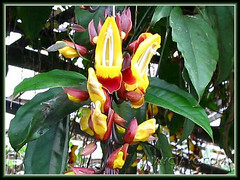 However, it flowers all seasons indoors in greenhouses. More info on how-to trigger flowering from forum members at GardenWeb. Propagation: Easily by cuttings from firm and healthy stem or simple layering. Tip cuttings in water can easily produce good results too. Can also be propagated by seeds, though rarely available. Usage: Thunbergia mysorensis is widely cultivated as an ornamental vine in the gardens. Grow it to cover and decorate garden fences, trellises, arbors and arches. If possible, get them trained high up the pergolas or overhang to allow the strikingly beautiful pendulous racemes to dangle freely for a spectacular display! 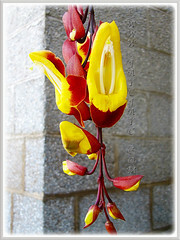 An ideal landscape flowering vine that can be grown on ground or containers for added interest. It is an excellent attractant for hummingbirds and pollinators because of its flowers’ overflowing production of sweet nectar. Grow in greenhouses for all seasons flowering or outdoors in the mildest subtropical regions. Thank God that we have archived photos to keep us delighted and contented! These blooms are really showy with their contrasting colours. What an appropriate and nice name too. I bet Cinderella will be happy to try them. :) Thanks for dropping by, A. Belle!